These are not the most important stories of 2011 and they're not the most-read stories, either. These are just our readers' favorites, narrowed down by Jalopnik readers to just ten classic stories. 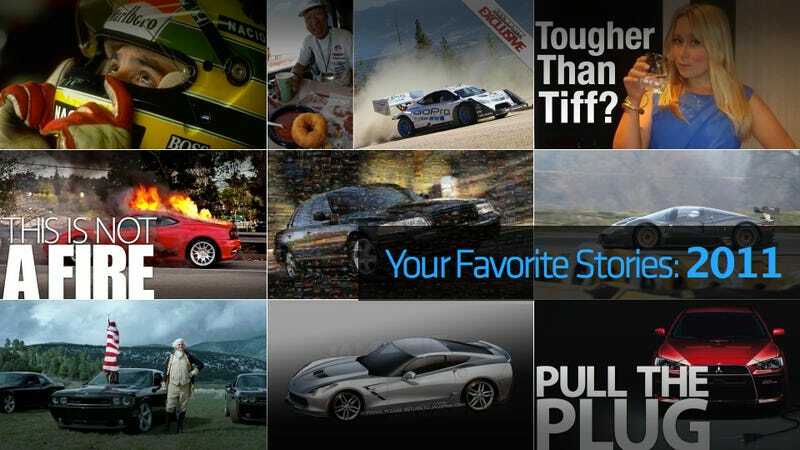 What was your favorite car story of 2011? Why it stood out: This year we met Lindsay Orridge, a marketing manager for Ford Motorsport, who pitted her five-foot frame against four muggers trying to steal racing veteran and famed Fifth Gear presenter/sultan of sideways' watch. She kicked their asses and sealed the championship for Jalopnik Badass Babe of the Year. Why it stood out: A man once said that those who do not study history are doomed to repeat it. We would like to go back in time and do a burnout on that guy's lawn. Everyone shared their own visions of this classic fantasy in this, your favorite top ten of the year. Why it stood out: This year in Formula One witness the absolute dominance of the German Wunderkind Sebastian Vettel, but following the season race-by-race made it hard to grasp just how strong he and his team really were. Put up in a chart we can see just how cleanly Vettel walked away from the competition and how different the championship looked this year compared to the back-and-forth of 2010. Why it stood out: The last of its breed, the final Ford Crown Victoria marked the very end of an exceedingly long production run and an even longer history of full-size, body-on-frame, V8-powered, rear-wheel-drive sedans. It was the conclusion of a great, thirsty, comfortable American era and it got the brilliantly-written eulogy it deserved. Why it stood out: It was the build thread to end all build threads. It was the ultimate forum fantasy made real: take a Ferrari 430 Scuderia and turn it into a beautiful, carbon-bodied retro racer and take it to the grueling and near-mystical 24 hours of the Nürburgring . We covered the whole story from start to finish. Why it stood out: We were all swept up in Senna fever this year, with the exploits of the man and the amazing documentary covering his life and death touching us deeply. No one caught the feelings of joy and pronounced awe we all shared as when Matt Hardigree went and saw the movie with a complete outsider. Why it stood out: This year we saw Saab finish its final death throes after decades of diseased decline. Mike Spinelli argued to take pity on the favored Mitsubishi Evo and grant it a quick death, rather than something like the years Saab spent on life support. It's time to pull the plug on the Evo. Why it stood out: The automotive equivalent of the four-minute mile was broken this year, by none other than Nobuhiro "Monster" Tajima just weeks before his 61st birthday. Jalopnik man-about-town Bill Caswell showed us that this wasn't just a small victory for a Japanese man while his country back home was pulling itself together after the tsunami; it was a victory for a diet of chili dogs and doughnuts. Why it stood out: We got to break the look of the 2014 Corvette so early that people still can't believe that we got the look right. Why it stood out: Chris Harris broke the story of how Ferrari cheats and tweaks the cars it lends to the press, just so it may feel eminently secure that no Porsche crest or Lamborghini bull will match a Ferrari in a magazine comparison. It was the high-horsepower dig into the privileged world of car writers that we were all waiting for but no one — except us — would publish.